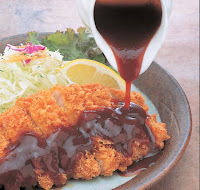 My Favorite Japanese Foods (No.6) - Bull Dog Tonkatsu sauce. It's basically a vegetable sauce. We Japanese use this Bull Dog Tonkatsu sauce a lot for many homie dishes - mainly for Tonkatsu (Deep fried pork cutlet. Picture ->), Corrokke (Deep fried mushed potato), Okonomi yaki (Assorted pancake) etc. There are sauces exclusively for "Okonomi yaki", but basically similar to Tonkatsu sauce but only a bit different. (I don't know what's the difference exactly but I guess it's thicker?!) I use this Tonkatsu sauce instead when I don't have the "Okonomi yaki" sauce. But you can't miss this sauce when you eat "Tonkatsu" :) I can eat a lot of cabbages (It's the golden side dish for Tonkatsu) with this sauce. Ummmmmmm :D Some people use just salad dressing, some people use soy sauce & mayonnaise on the cabbage. I like just eating it with Tonkatsu sauce. Check out my favorite Japanese foods on Yelp as well. Uh-oh. You got me craving for some Tonkatsu...w/ Bull Dog Tonkatsu sauce. I have been craving for tonkatsu and went to the local Seijo Ishii for hire-katsu takeout. They did not give away tonkatsu sauce and karashi, so i went to the stores to buy my first ever own tonkatsu sauce. Bulldog was the cheapest, and came in a 170ml bottle. Most dogs really like fruits and will gladly take when offered. We will describe some types of fruits dogs really like and whether they are safe for them or not. Join me in all of my adventures and share in the experience and quest for unique and eclectic food. Recent reviews by Akiko I.